Town of Waterford: The subscriber has appropriated a tract of land on the north side of the Susquehanna River at Anderson’s Ferry, for a new town to be called Waterford, and wishes to dispose of the lots on the same by way of lottery. Waterford will be excellently situated on account of health, will afford an elegant prospect and good limestone water in abundance. It is laid out at right angles each of the upper lots are 200 feet in depth and 30 feet in width, fronting on a main street, and having a 16 feet alley in the rear. The water lots are 132 feet in depth , and 40 feet in width, separated from each other by a 10 feet alley. All lots will be clear of ground rent. The bank of the river is to be kept open for the use of the holders of the town lots and for no other persons whatsoever. No privilege however will be given that can affect the interest of the present ferry. A plan of the town can be seen at the house of Mr. Hugh Wilson in Lancaster, and at Anderson’s Ferry. The drawing of the lottery, it is expected, will commence in the month of February or early in the month of March next. Tickets at sixty dollars each may be had of Mr. Hugh Wilson, and Mr. William Ferree in Lancaster, of Mr. John Pedan, Chickeys, of Mr. John Greer, Yorktown, and of the subscriber at the ferry aforesaid. With this advertisement the first step toward the establishing of the town of Marietta to have had its start. 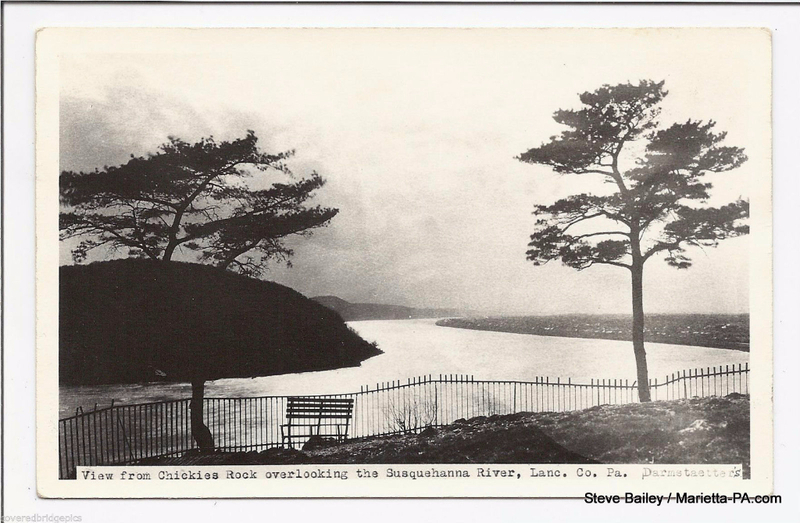 The history of the actual settlement of the location, however, precedes that above lottery by almost a whole century, for it was in 1715 that the first of the stalwart Scots-Irish arrived and located along the Susquehanna River above Chickies Creek. The land was particularly attractive to settlers, having been cultivated previously by the indians of the district. In addition, the heavy surrounding timber promised ready materials for proposed construction of dwellings and farm buildings. Finally, the river itself and its tributary streams offered abundant supplies of fresh water fish. One of the early Scotsman, Robert Wilkins, an Indian trader, had acquired three hundred acres in 1719 and, in 1727, sold the tract to the reverend James Anderson, pastor of the Donegal Church. Anderson’s son, also James, possessed talents that were apparently more enterprising than to lead him into his father’s profession, for it was the younger James Anderson who, inheriting his father’s land, established the ferry that plied the river at Marietta and built the splendid structure on the York County side of his route at Accomac. Two generations later the fourth James Anderson laid out the town of Waterford on the land. In 1719 another Scotsman, George Stewart, had taken up several hundred acres immediately to the east of the Wilkins holdings. In 1733 the land passed to his son, John, who in 1748, with his wife Ann, sold the land to David Cook. Cook in turn gave the major portion of the tract to his son, David. The lack of inventiveness in devising names for offspring was hardly less remarkable in the Cooks that in the Anderson’s, for it is recorded that one generation later another David Cook laid out the town of New Haven . The one hundred and fifty-nine acres which the earliest David Cook had given to a second son, James, was retained by that young man until he sold it to Jacob Neff in 1786. One of Neff’s offspring, Catherine, married Henry Cassel, who on April 17, 1806, bought the Neff land, only to sell it early in 1814 to Jacob Grosh. Grosh subsequently laid out the land in building lots comprising roughly the easternmost four blocks of the town. Grosh himself named the community Moravian Town, but it was nicknamed Bungletown and was so called for some years. The major feat of bungling, however, was undeniably at the place of juncture of Cook’s and Anderson’s village along the “S” bend on present day Market Street. Just as Anderson was to do a year later, Cook gave public notice in 1803 that in his newly laid out town of New Haven hundred lots would be disposed of by lottery. Although Anderson started his town a year later than Cook, the former’s venture grew more rapidly from the start and continued to do so until the towns were consolidated. In 1813 land bought shortly before by John Myers, running from that alley crossing Market Street halfway between Locust and Pine Streets on the west to Grosh’s addition on the east, completed the central and eastern sections of the borough. In the naming of those Irishtown streets there lay an interesting tribute to the naval history of the earlier years of our country. The founders named each north-south street after an American naval hero, thus accounting for streets called Biddle, Jones, Decatur, Bainbridge, Morris, Hull and Porter. The east-west streets derived their names from outstanding American naval vessels – Essex, United States, Wasp, and Constitution. When the charter of the borough was granted, the omission of Irishtown was not accidental. The citizens of that western end of town had resolutely maintained their resistance to extending the borough line to include their property. Benjamin Long purchased about thirty acres of the Anderson farm at an early date, and these occupied that land beginning on the north side of west Walnut Street and extending to include those properties of the north side of Fairview Avenue. This land Long laid out as an addition to the town of two hundred and eighty-two building lots. The whole portion was included in the later corporation of the borough. Anderson chose to call the main thoroughfare of his section “High Street”. In the Cook additions, this same street was called “Second Street”. Unoriginally enough, Grosh named the continuation of the road through his own addition “Third Street”. In Irishtown, the street bore the name “United States Street”. In the last quarter of the 1800’s, some benefactor whose name was never recorded imposed at least the consistency of name on the whole thoroughfare by calling it officially “Market Street”. A seeming eccentricity in the design of the borough is the peculiar manner in which the town sprawls for a mile and a half along the river but is little more than quarter or half a mile wide. The principal reason for this is that at the time of the laying out of the villages river trade had assumed large proportions and was for many years the main element of business in the town. River frontage, therefore, was vital to the survival of the town. By 1812, then, Anderson and Cook agreed to procure a charter from the legislature. It was granted them and the town name of Marietta was agreed upon, though it is not entirely certain just how the name was arrived at. One account that the name was taken from Anderson’s wife, Mary, and Cook’s wife, Henrietta. Another story has it that Mary and Henrietta, or Etta, were Anderson’s two daughters. Another story finds that Anderson’s first wife was Mary Bayley and his second wife was Mary McQueen, and that Cook’s wife was Mary McFarquhar, and that the town was named in honor of the three Marys. To give you an idea of the businesses in Marietta, a list of taxable landholders in 1814 included 9 lumber merchants, 21 carpenters, 21 joiners, 5 masons, 3 painters, 5 plasterers, and 5 nailers. In addition, there are listed 10 coopers, 6 butchers, 9 tailors, 4 pilots and 3 ferrymen. The list also includes 14 tavern keepers, but only 1 pastor, indicating either that there was slight patronage for the pastoral services or that the power wielded by that one pastor was unbelievably influential in the community. Growth of the town was quite brisk during the first few years, but with the economic crisis that came in 1817 expansion was seriously checked. Anderson, who had anticipated a state bridge across the river at Marietta, had expended most of his money in grading a road across Chickies mountain into Columbia, and when the panic of 1817 struck and the bridge idea was abandoned, he left Marietta in embarrassment and moved to York. 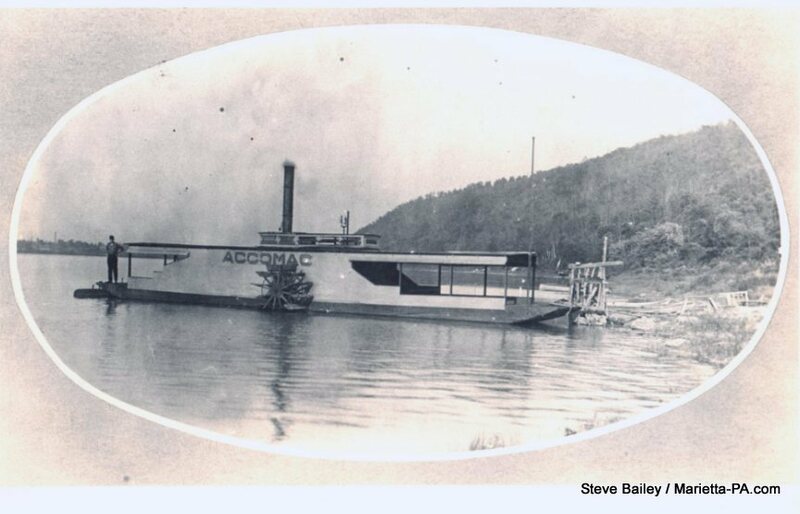 Anderson did not have the only ferry to operate in the Marietta area of the Susquehanna. About 2 miles upstream from Anderson’s route, an enterprising German landholder named Christian Winiker also operated a ferry. 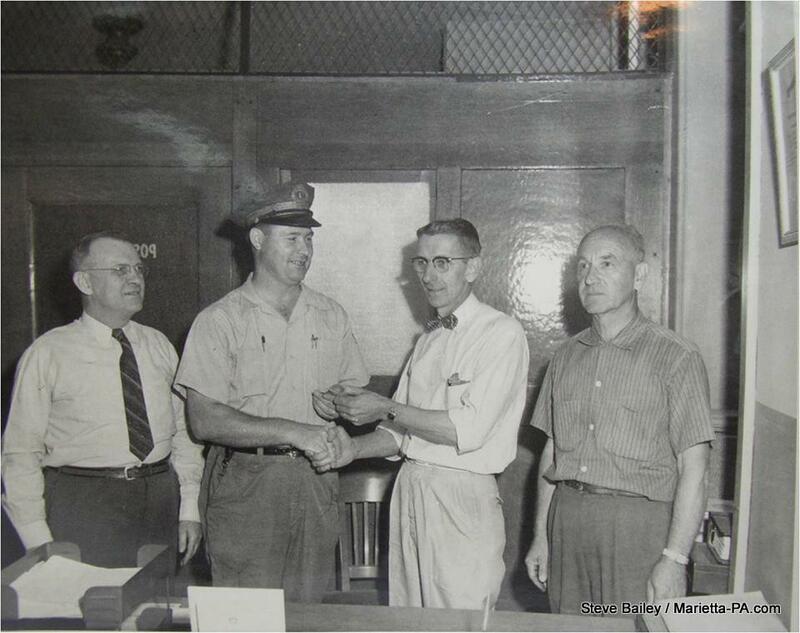 Pronunciation of his name soon became locally corrupted to “Vinegar” and today is known as Vinegar Ferry. Recovery in the community was delayed until the years between 1825 and 1830, at which time the Pennsylvania Canal was built through Marietta. This introduced a period that was apparently quite wild in some of its social manifestations. It is recorded that whiskey was distilled on almost every farm in the area and that the people of the borough were given to “the pleasures of the cup”, for though much of it was shipped out to other towns, no small amount went into local consumption. In 1816 a market house was erected in the area of the square at Market and Gay Streets on a wide plot. It must have been a strange sort of building, for it is described as standing upon stilts. 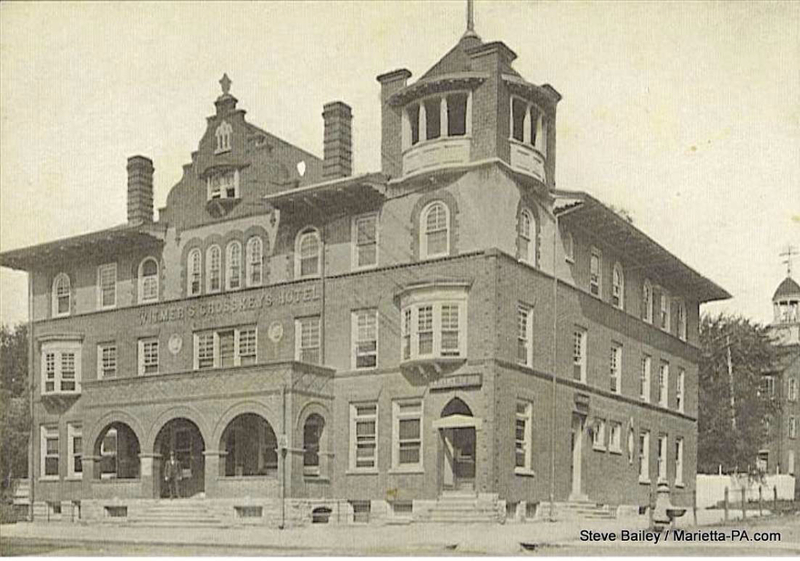 Many years later this building was taken down as an eyesore; then, in 1874, a stock company was formed and a brick market house was built the following year on what is today the playground area of the old Marietta school. The earlier market house at the square had been built with a large second floor room to serve as a dance hall. Accounts that survive show that the festivities of those dances were often leavened by the intoxication of more that waltzes and gavottes. Finally, Marietta is recorded as the scene of some of the earliest harvest fairs, “whither many merry-making people were drawn, for more than a view of the exhibits.” Whether it is an injustice to surmise that life in the town during those years was considerably less than sedate, one cannot with certainty say. However, the same account informs us that “shortly after this time there was a religious revival and much of the carefree life was abandoned”, though it may be hard to imagine a more abandoned sort of social life than was recorded of those previous days. At any rate, the dance hall is said to have become a meeting house in which many were converted, either because of a deep religious sense or because of financial straits possibly induced by the Civil War. It is known that the War Record of Marietta has always been an admirable one. In the war of 1812, two companies from the town and area marched into Maryland to the defense of Baltimore. One was the notable Marietta Grays, commanded by Jacob Grosh. Just before the Civil War five companies of troops were formed commanded by Captains Roath, Congdon, Miller, Eagle, and Ettla. When confederate troops reached the southern bank of the Susquehanna and the Columbia bridge was burned, the news from Gettysburg fired the hopes of the citizens of Marietta. It is recorded that the women of Marietta were ready to serve the Union. When the call came in for food for the wounded soldiers at Gettysburg, the women of Marietta baked two wagon loads of bread and dispatched them to the battlefield. Earlier these same women had spent much time, effort, and expense in preparing linen bandages for the Union wounded. Historian Hugh W. Nevis, in his account, makes rather a thing of noting that “In 1830 the Pennsylvania Blues and the Donegal Rangers were organized, commanded by Captains S. S. Rathbone and John Huss.” Since history reveals no war at the time of their existence, these two companies seem to have no other claim to fame than their stirring and colorful appellations. When you contemplate the romantic history of Marietta, you’ll probably most readily visualize the almost swashbuckling days of the nineteenth century when canal boats laden with coal and river rafts loaded with lumber and pilots floated seasonally into the community from upstate bringing raw materials to supply local industries. Logically, these early industries were concerned with building and expansion. 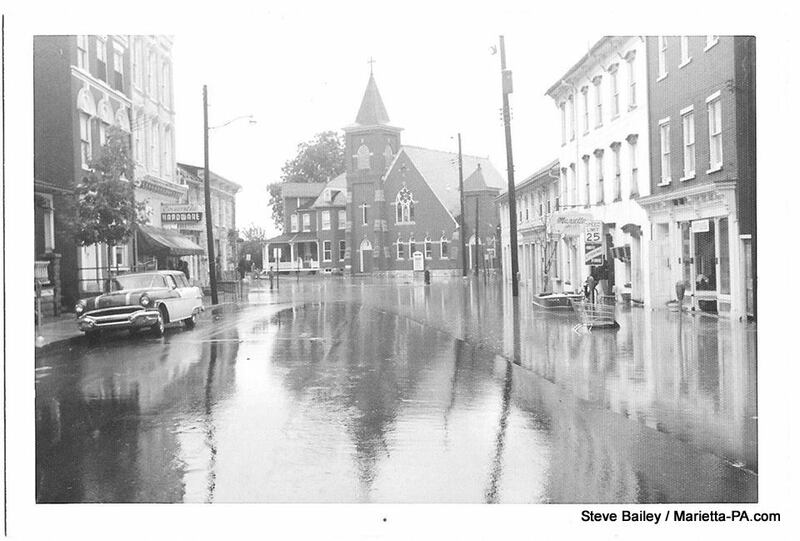 Planing Mills, lumber yards, carpentry shops, and allied businesses vied with the taverns as the backbone of the local economy. 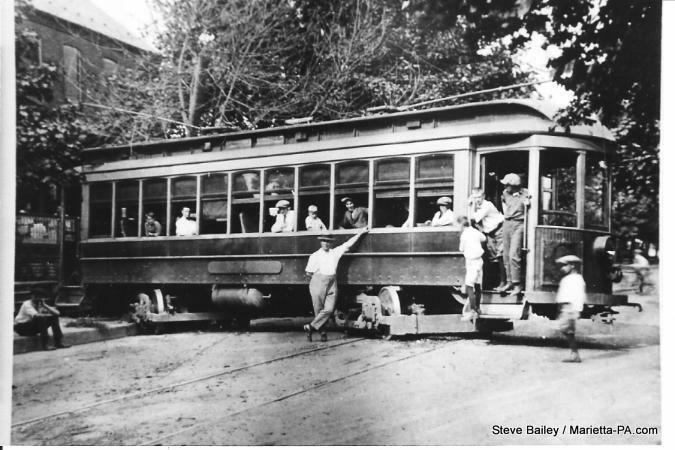 Timber had been not only the chief structural material in the growth of Marietta and surrounding communities, but wood was long the chief fuel for the pennsylvania citizenry. Consequently, lumbering in all of its aspects was the major industry during the middle 1800’s. Yet the industry that seems to have left its mark on the community was iron smelting, though chronologically it follows lumbering. At one time there were six furnaces operating just east of the borough. Ore was provided from the Chestnut Hill mines primarily, though some local ore was processed. The industry continued well into the twentieth century. Doubtless the most vital remnant of the important iron industry in the community is the very much alive residences of the original iron masters. Still standing and in excellent repair, nearly half a dozen of these stately homes occupy their grounds on the stretch of land just east of the town along state route 441. Significant industry, however, was not always concerned with furnaces and sawmills. Also located in Marietta over the past years were a soft hat factory, two silk mills, a hollow-ware and enameling manufactory, two cigar factories, a shoe plant, a soft drink company, and a concrete block plant along with many other various types of industry that have come and gone. 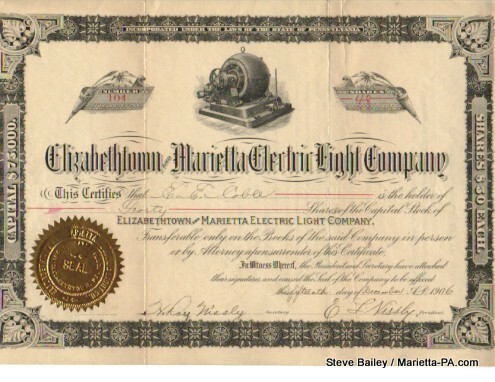 Although many industries and people have come and gone over the years, Marietta is still here and still rich in its history and heritage and will never be forgotten.